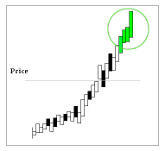 A down market can still make room for a bullish momentum pattern. Today we look at one such pattern in a Nasdaq 100 component. We will examine the outcome of going long a weekly out of the money (40 delta) call option in Intuit Inc just three trading days before earnings and selling the call one day before the actual news, but only if the prior earnings move, from the quarter before was up. We can see that the prior report created a stock pop of more than 1%, so this next earnings release from Intuit in November, does have a trigger. This short-term trade hasn't won every time, and it won't, but it has been a winner 8 times and lost 1 time when the condition has been met. ➡ The average percent return per trade was 38.1%. ➡ The average percent return per winning trade was 48%. ➡ The percent return per losing trade was -41.7%. ➡ The average percent return over the last two-years per trade was 52%.